Evergreens Salads Kicks Off Support for N.F.L. Taking on improving the health and well-being of the community is an enormous commitment. Thankfully, Virginia Mason has partners engaged in this mission who believe in the same goals. The leaders of Evergreens — restaurants that promote a healthy lifestyle by providing fresh, all-natural foods in salads, wraps and grain bowls — are supporting Virginia Mason in health education through the Nutrition & Fitness for Life (N.F.L.) program. The N.F.L. program teaches children and their families healthier lifestyle habits such as how to choose foods wisely, prepare nutritious meals together, find fun ways to exercise, reduce screen time and deal with weight issues. The program was initially free to qualifying Virginia Mason patients ages five through 18 but is now open to the public. “We have been looking for a great local partner that aligns with our values and purpose,” says Hunter Brooks, President and Co-Founder of Evergreens. “We are passionate about food, health and education. Virginia Mason is such a well-known and respected institution. We’ve grown up with them, had family members treated at Virginia Mason and been there ourselves. Once we heard about the N.F.L. program, we knew it was a great fit! In July and August 2017, as football season geared up, Evergreens did a kick off of their own. They offered a customized N.F.L. themed salad that was a take on healthy buffalo chicken wings. 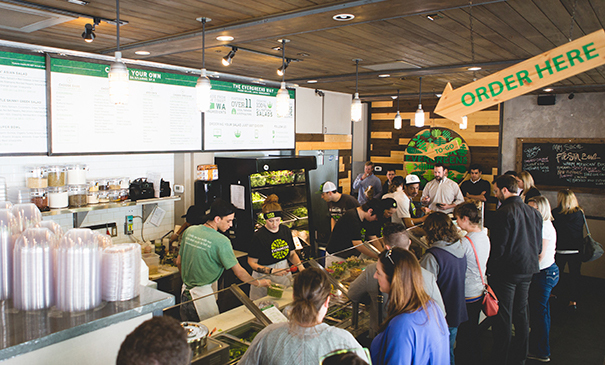 The company donated a $1 of every salad sold to Nutrition & Fitness for Life and sold more than 1,100. They also took donations and promoted N.F.L. when offering free salads as a soft opening of Evergreens in Fremont and Bellevue, with more opportunities coming in 2018. Launched in 2013, Evergreens is a Seattle based company, with seven restaurants in the Seattle-metro areas and more to come in Washington and Oregon—nearing 20 by the end of 2018. “Our mission is to make the world a better place to work and live by promoting a healthy lifestyle through clean eating, treating our team members and guests with respect, and by best in class ecological practices to keep our earth evergreen,” says Hunter.